I wanted to ask how the I process helps to produce the water and food we need every day? Wouldn’t it be a quicker process to help the world, if we would all find a job, where we produce water and food for our need today and even so much, that we can give something to others? The I Process is the course and – dare I say – process that each individual walks to first stand as a Self-Responsible being, taking responsibility for our own mind which is how we have created ourselves as individuals within/ as this world that only ‘care’ for a particular set of aspects that are mostly directly related to ‘who we are’ in terms of the place we’re born into, family, socioeconomic status, gender, culture and everything else that defines ‘who we are’ within this system, instead of realizing that within being part of this world we all should be born within a system that’s based on what is Best for All Life as the principle of Equality. What we have realized within this is that we can’t ‘help the world’ within the current platform we have of a system based in inequality that is Not supporting everyone equally by default. Any attempt to ‘help’ would only create further enslavement/ dependency on providing such help without actually creating the necessary support platforms to enable those that are ‘in need’ to be able to provide for themselves and have everything they could require to live in dignity. It is common sense that what is required is equal-power given to each individual so that no one is bound to remain in an inferior position, unable to fend for themselves. I suggest you search for the term ‘charity’ in this forum and you’ll get blogs and vlogs explaining how it is not an option because of the above mentioned reasons. Charity merely confirms that it is ‘okay’ for some people to be in need, to be disenfranchised from basic life support and requiring ‘help’ instead of setting a system that guarantees equal living support for everyone. Have a look at how you cannot only focus on ‘water and food’ when looking at the entirety of how the system functions in this world. Yes, they are primary points that enable every being to continue ‘living’ – yet, it is futile to only focus within these aspects only which is only considering a form of primitive survival that is certainly Not what’s best for all. Within the current system you will find the most outrageous policies wherein for example, if you wanted to extract water from a certain territory, you would have to enter a process of litigation with certain corporation that might have hogged the ‘rights’ to extract water from such area. Many beings are already seeing this as part of their reality wherein people from such cities/territories with vast amounts of water are witnessing international corporations coming in and taking the resources to sell them at exorbitant prices. Hence, people have no access to what should be given ‘equal access to’ – just like the basic needs you mention here as water/ food. This is one of the reasons why we first have to establish a political, economical and social system based on Equality so that the starting point of everything we implement as social policy is absolutely clear in terms of not being able to profit from providing the necessary means to survive for all. If you start looking at the ‘food’ point, you’ll find the same thing. An example I just found today: The Food vs. Fuel Battle Continues. See how this is about ‘policies’ that are NOT considering what’s best for all, and only considering how to maintain their interests on the top of everything else, instead of actually considering ways to stop the unnecessary consumption of fuel, which as we know is pretty much linked to how everything in this current system functions: endlessly producing and consuming just to ‘generate enough money’ and keeping the entire system running. What the I Process allows you to see/ understand is how each one of us as individuals have neglected the interconnection and multiple conditions we have placed onto everything that is already here as part of the Earth, just so that we could find ways to have masters and slaves = creating a system of inequality is based on the necessary acceptance of some being being ‘lucky’ enough to be born in a golden crib, while others are born in conditions that can enslave them for life, without having any possibility to find opportunities to progress and support themselves effectively. Any form of slavery/ inequality is the direct result of the mechanisms of the mind within an eternal desire to win, to be ‘more than,’ to obtain some form of ‘power’ to believe and perceive to be above others wherein, when translated into a monetary system, manifests as ‘the rich’ and ‘the poor’ wherein we eventually accept both polarities as part of the system, without having ever pondered why it is that such forms of abuse have been acceptable since unmemorable times. This process is walked in both ways: in an inner/ outer perspective -which is how we are currently walking here. Realize that it won’t be as easy as ’empowering people to extract resources and distribute them equally’ – that’s just One single aspect wherein money will be the tool to make sure mathematics aren’t able to be manipulated in order to only benefit some. Among many others, we require substantial changes in laws, education, how industries operate, we require to stop the ability to make any form of profit, which is in essence having ‘power’ over another = abusing others in the name of money. This implies that there will be a general expropriation of resources, implementing technology and making use of logistics to distribute the necessary for all equally, regardless of any political veto, cultural barrier, language, etc. – this is looking at how we exist in a world separated by nations, cultures and religions that are now creating the current wars based on basic needs like water, food and the current fuel of the system which is oil – All of it because of not having first looked-at/ considered HOW we have disregarded Equality as the very starting point of existence as human beings, as that prime relationship regulator that has never existed in our judicial systems. Hence, I suggest you take your question and look at the origin point of separation wherein we have neglected our ability to give to each other what we require to live, which is in common sense, giving equal access to food, water and everything else that ensures a dignified living condition to every single being – not only humans of course. That’s how and why we are able to take any current problem and place it into perspective to understand how the key point is educating ourselves within the principle of Equality. It is vital to first stand as a Self-Responsible being that is able to see/ understand how we ‘work’ at a mind level, to then correlate how we have implemented such inner workings as our current socioeconomic and political systems. That’s what we walk then as an individual process wherein we work with ourselves, with our own thoughts/ feelings/ emotions/ beliefs to eventually get to a point of standing one and equal as our mind. In essence no ‘human nature’ will be able to get in the way of providing for another or having to depend on a job to exist. 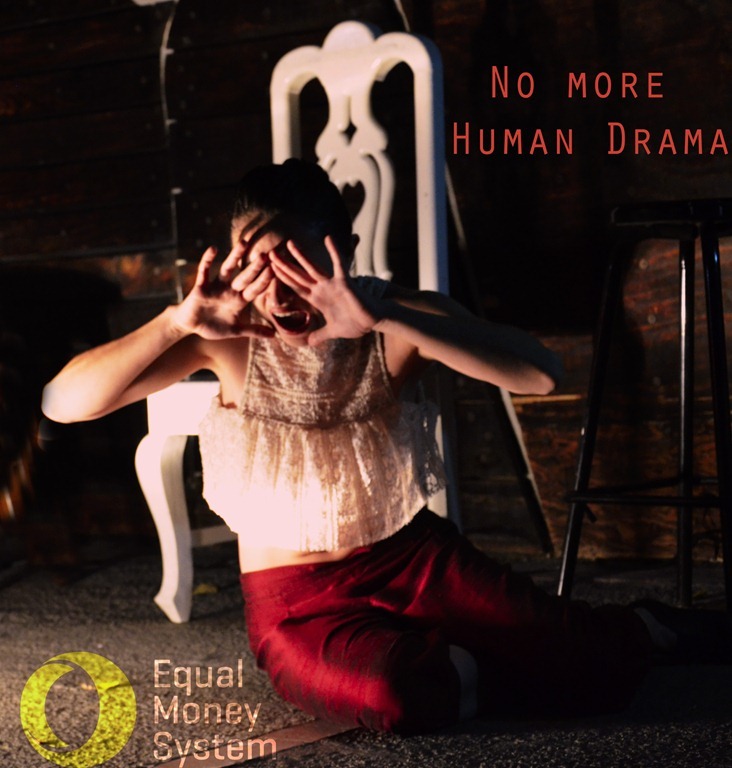 Equal Money is about giving equal access to everyone, not only ‘sharing’ but giving the birth-right to live in dignity – no one will have to become the charity-helper person, but rather become a being that promotes equal living-access to resources within the common sense point of how everything we require is already here is of the Earth. We are on Earth, hence we all should have the same ability to make use of what is here to live = common sense. This is part of the simple approach we have to promote and speak about within this world, which is currently being neglected/ not paid enough attention mostly due to the indoctrination process that is making sure no one ever considers such basic common sense points as the requirement to change/ reform the entire current system – as well as all the interests that are being safeguarded within an unequal system. Thus within the I Process we become the individuals that are able to prove to ourselves and each other that we are in fact considering what’s best for all by our very own application through the points that we learn and apply within it, which is directly linked to seeing how an Equal Money System will become the platform to be able to live-by and apply such living-principles as a point of Self Responsibility, for all-equally. No more ‘elites’ required, no more ‘special individuals’ voted on, everyone is equally empowered to see the common sense required to direct any situation and stand within a principle that will be the actual guideline to support each other in this world. Eventually the Desteni I Process will become part of the necessary foundation to educate everyone in this world. Hence I suggest you research on it because it is worth-while supporting oneself through reading others as well. There can be no ‘missing point’ if all points are equally considered. Inequality is the source of failure in the world – when this is understood, Equal Money will be embraced as the only answer that can eradicate the current severed relationships based on cultural differences and political discrimination. This is why Equal Money begins within each one of us removing all possible beliefs systems of separation and educating ourselves to be able to coexist effectively standing by one single principle: Equality as Life. Without Equality, all “solutions” will fail. Let us know if this is clear enough or you require further perspectives on this point. Water and food we consume every day at the Equal Money System forum. Psychology is part of the mental health industry, which means that, just as anything else in this reality, we have made of our understanding of the mind another business that is requiring human subjects with apparently ‘incurable’ traits accepted as ‘human nature’ that must be periodically ‘treated’ in a continuous attempt to stop such conditions. Within its current conformation, psychology has failed to support the human being to take self responsibility for any ‘mental disorder’ that must be realized as self-created; instead it is taken as a subject of study to create more theories wherein all the aspects and context of what generates such ‘disorder’ is accepted as ‘real’ and ‘unchangeable.’ This means accepting thoughts, emotions, feelings, desires, wants as ‘who we are’ which are the building blocks of any ‘mental dysfunction.’ That’s how psychologists have secured a constant clientele because of us human beings deeming ourselves as ‘flawed’ and requiring ‘professional support’ to correct it – that is, those who can afford it. Instead of psychology being a separate study that relatively few take on as a profession to make money, it will be part of the integral education and understanding of what it is that we are creating ourselves as in relation to our mind. Therefore psychologists will cease to exist within the context they do now, as everyone is able to take self-responsibility for their own experiences through a process of investigating how we created such experience in full detail, rather than trying to find ways to ‘cope with it’ in our day to day living. Psychology enforces the victimization of the human as being ‘incapable’ of supporting themselves while requiring people with such credentials to give you some ‘support’ for it. Abdication of Self Responsibility has been a constant factor in our reality, which is how the concept of ‘god’ was created in the first place – therefore we realize that there is no cure other than supporting and directing ourselves in ways that have never existed before which is: living as equals = working, living, thinking and doing that which is best for all. This is part of what we are walking as Desteni and the Desteni I Process wherein we are supporting ourselves and each other to become our own ‘psychologists’ within the basic principle of getting to know ourselves. These same tools will become part of the basic human education. Equal understanding and application = best for all outcome. We begin with taking self responsibility as our mind and walking a process of Self-Forgiveness in Self Honesty to give ourselves a blank slate to script ourselves to live in effective ways. We realize we don’t require any form of medication but self-direction and self will to correct our actions, thoughts, and spoken words in every moment. Within this we no longer accept ‘human nature’/ human behavior as something ‘unchangeable’ and instead we instate ourselves as the creators and directors of our reality. 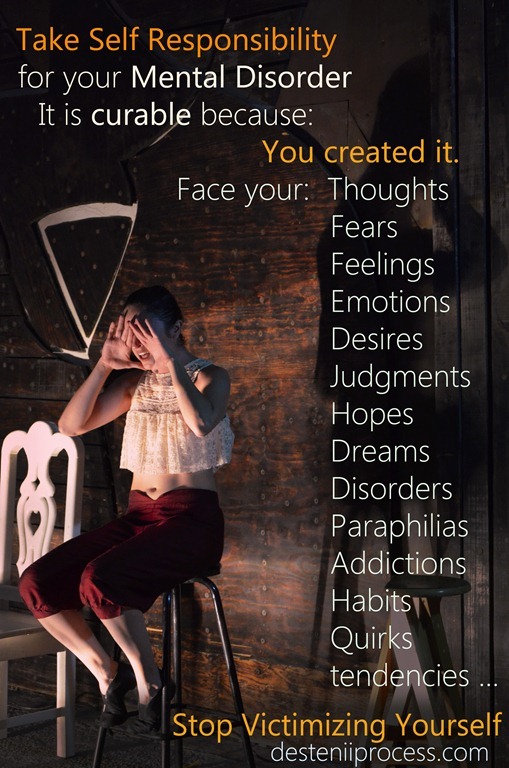 Once we step outside of our personal troubles, we start seeing the greater picture where we see a reality that requires physical solutions to stop physical suffering – our ‘problems’ are then put into perspective once that we become aware of the reality we have neglected while being caught up in the mindwebs of our experiences. Specific support and assistance will be provided for anyone experiencing and/or presenting specific cases of mental instability that may lead them to harm themselves or others. This is the necessary rehabilitation that each person will have to take on as part of their self-responsibility within an Equality System. Each case will be walked to the point where we can make sure that the person is able to coexist effectively in society. A buddy-system will be available so that we can all check upon each others’ application and support whenever it is necessary. This way we won’t be requiring to ‘go to the psychologist’ every time that we are facing some difficulty in our inner experience. We will become a network of self-support as we will all understand and live by the same principles = equality in action. Money won’t be a cause of inner conflict that is created out of lack or fear of loss which certainly affects our stability within everything we do. We will have enough time and supportive networks to assist people to support themselves with the tools to walk the process of self correction. This will be much simpler than it is now because there will be no pressure over ‘time = money,’ and there will be no need to fear losing relationships that existed only as financial pillars or any other form of current limitation because each one will be supported to live. There will be plenty of time to support ourselves wherein self expression will be a key point to transcend our past limitations that stood as the reflection of a system of abuse and limitation. For now, we can only expose psychology for the false solution it has been in this reality in spite of the multiple theories and ideas that have served only to glorify people’s egos and pockets, without having any relevant or consistent effect to generate solutions for the human mind. There is no quick fix to this either, we have to literally program ourselves into being humans that consider each other as equals and exist in ways that are supportive for all beings in this world – and we are already walking the main task that has been disregarded all this time. Is Psychology Capitalism – or Capitalism psychology ? 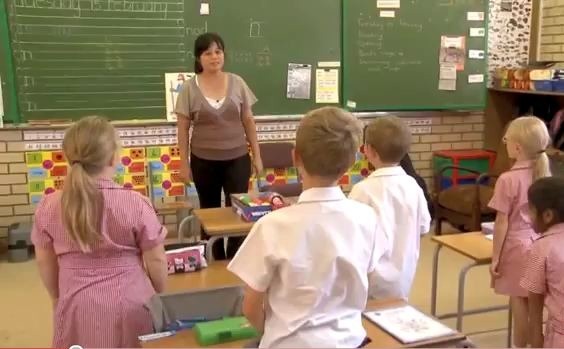 South African kids are being taught the language of the most influential economic world power which is supported by Parents that see this investment upon their kids as a way to secure their future. Certainly this is not a ‘random language’ and there are obvious interests behind this language-learning encouragement due to the growing investment that China is pouring over Africa and specifically in South Africa, where kids can get to write and understand basic Mandarin by the time they reach junior high. This trend is not only seen in SA but all around the world including the United States where 1600 schools are implementing Mandarin as part of their curriculum for kids at an early educational stage. This is now topping over the previously popular language to learn which was Japanese. What’s actually driving this multi-language education? In an ever growing world of competence, climbing up the ladder of success is linked to the bigger picture as the world economy and the future tendencies of investment according to the world market. How does that get to influence children’s lives into learning a seemingly unique language which wasn’t popular to learn at all some 20 years ago. It is certainly linked to money and parents looking at the best ways of supporting their children with tools that will secure them financially speaking in the future. What’s usually overlooked is how learning a language won’t necessarily mean giving ‘proper education’ to children. IN a world where money sets the rules and the languages to learn, there is a strong requirement of understanding that actual education goes beyond training children to make money in this world, basically learning how to be the best ‘survivor’ escalating the ladder of success. What’s often overlooked is the requirement of actual Education based on principles that will create and shape human beings that value LIFE before Money and this is being overlooked around the world when it comes to realizing how we are shaping and molding – read “educating” children – based on survival and act-skills, instead of principles such as valuing Life as themselves, Equality, Self Honesty and Self Responsibility to support a change in the world which is what’s required, not necessarily giving more ‘weapons’ and ‘tools’ of survival in a world that’s become the most savage human market in terms of jobs and professions. Because kids are unconditionally accepting the ways of the parents as ‘how things are’ and they basically follow what they’re being taught and what they are being impulsed to accept as ‘normal’ in terms of how the world exists, we require to educate people that are parents or to-be parents to realize that the starting point of Education must change from survival and becoming money-making wizards, to an actual emphasis on principles that will allow the child to know that the way of walking in this world is not about competing or winning a game, but about supporting themselves and supporting others as themselves. Children are genetically copies of parents therefore, we require parents to support themselves to transfer such self-realizations as seeing that Education goes beyond training a person to survive but it actually requires to change its starting point to that of living by Principles of Self Honesty, Equality and understanding how within each individual changing its starting point within this world, the world can change. Within this we can see that children can definitely learn Mandarin or any other language yet the starting point and understanding of what’s most important within this world will be in place which is Equality as Life – after that any point of education within the current system can be used for purposes of supporting themselves effectively without missing the end of it all, which won’t be only becoming filthy rich and having the top jobs in their countries, but becoming leaders that will care for a change in this world, people that will grow up realizing that a change in the world is required and that the transformation will take place when the world is in their hands. After all, Children are the Future of the World – that’s what we always hear yet! If we continue perpetuating the same ways of the current world transmitted from parents to children = not much will change and we’ll just improve the survival skills with no actual change. At Desteni we are focusing on educating ourselves the ‘adults’ in this world that will eventually be having kids or not, educating already existing parents to teach to their descendants how it is that we as human beings require an actual Education based in Equality, in consideration of each other as Equals with actual practical application that will consider an entire reform to the Education System which Is certainly flawed and money-driven as we’re seeing in this example of kids learning a language that would seem unthinkable considering that South Africa is nowhere near China – yet money rules the world and dictates what’s the next big thing in terms of money. So, let’s make the parents the actual teachers of this world to breed a world that’s best for all – visit the Desteni I Process website to Educate yourself and Invest on Life Skills that can be practically applied no matter where in the world you are. Investigate the Equal Money System to see how Education will no longer be directed by money-making skills but Life Skills to LIVE and not merely survive.